I bought these together, and photographed them together for my first book... but are they truly a pair? They fit neatly together and to be honest I made an assumption... The handle of the lid is the same style as the Apollo lids (see page 102 of my first book) but the Apollo handles are fluted. Is the lid vitrified also? I got scolded, won't say who by, for having a white lid on my green Narvik sugar bowl, but I'm not going shopping for a lid. *coughs* It doesn't look right to me, but what do I know? Ev!!! Mate!!! you were supposed to look up your magic files and tell me yes or no for sure. The lid is vitrified. I will have a look around when I get a chance and see what I can come up with. 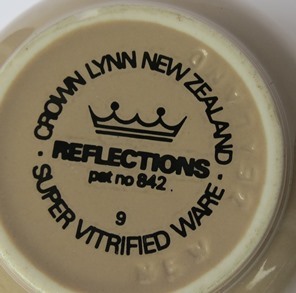 If not the Reflections, then what does the lid belong to that's also vitrified? I agree it looks odd. 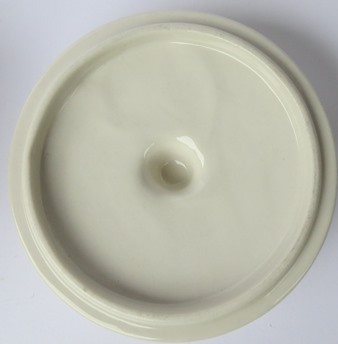 Is the bowl shape the same as the 760 earthenware which is 733 vitrified? 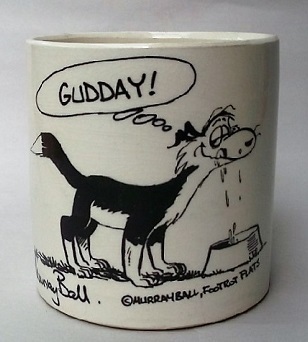 Not that I've been able to find a lid for it ....... yet !! It could be hidden in the four digit numbers though! Sorry Ev for my cheeky demands on your time... It does look the same shape as your 760, with an obvious foot ring as depicted on your pic. I guess the thing that makes me think they fit, is that the inside of the lid has a ridge in from the edge, that fits reasonably neatly inside the lip of the bowl. I will bring it to meet you when you are up in a couple of weeks. I must add that the lid is the right one, it's the colour that I'm not happy with. Whew looks like at least i was half right. Thanks Ev. and there is a little one too and they both look like they have white lids, don't they! Wow. How funny! I had never even noticed that the sugar bowls were in that pic.... just as well one of us is paying attention. Found the lid in the drawings!!!!!!!!! Richard Quinn has 4 1/2" by this shape. I'm going to be contrary again! The numbers are all beyond me and the measurement sounds good, but when I look at the photo in the blog I see definite shadows that indicate that the lids to both pots sit WITHIN the pot, NOT ON TOP as per Val's photo above. What I see in the advertisement is a dark glazed exterior to the pots/bowls, a white interior, and a lid of pale glaze (but not white). 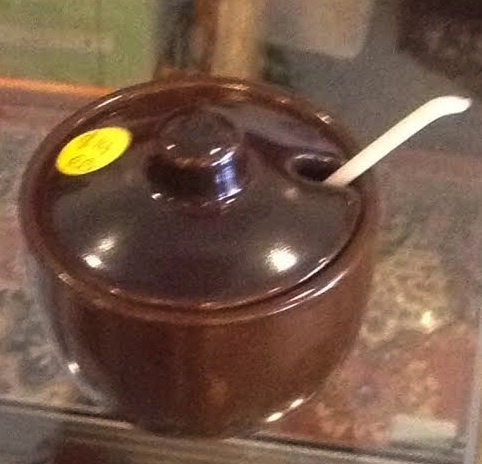 I have seen what I think is the small bowl and lid, be it sugar or mustard (all in one colour), at Rainbows Relics. 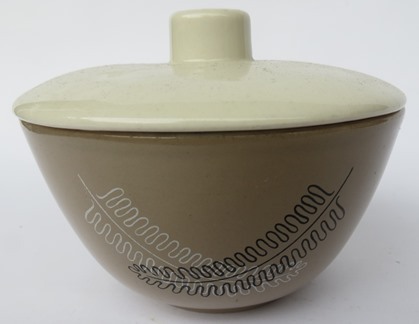 Is this Crown Lynn, and is it the right shape for the small bowl in the blog photo? May have been different for Reflections. As I say I don't have a grasp of those numbers yet. I've seen the same lidded sugar as Val's for the Intercontinental Hotel the teal one with design and it had a teal lid. I'm sure that banker had one listed and I've contacted her, but she hasn't got back to me. I've never seen that lidded pot with a spoon hole in it before I don't think. It has a Crown Lynn professional look about it. Does it have any backstamps on it? 100% sure that this is the right shape after Val sent me her original photo of the new vitrified ware from 1968. Kat I have a hunch that your little pot is the one to the right of Val's bigger one. Jeremy this looks like the Intercontinental one that Kat just posted in the 871 Mustard topic !!!!! This whole page is of Vitrified ware shapes and I wish I had more, but so pleased that I have this one! Just noticed that there are a few teapot lids on that page that look very similar! It's good to see the 1621 creamer there. I always thought the 715s were a good match for the vitrified teapots and Cook & Serve cans etc. The 1621 is the same tankard shape as the 715s and stands the same height as the 3614 individual sugar bowl. Although the bowls appear to have no number and the creamers do both are impressed NEW ZEALAND on the base. I have 1614 ashtrays in Red and Blue Tango transfer (redundant since I stopped smoking) but am still looking forward to seeing a 1620 coffee/water jug. 715's become 816's when they are vitrified Jeremy. My Tango Blue 05 just has "05" (plus impressed New Zealand) and looks vitrified so I guess that will be an 816, but my Duck Egg Speckle 05 which also looks vitrified has "715 - 05" (plus faint crown lynn stamp): I thought all Duck Egg Speckle was vitrified? ?